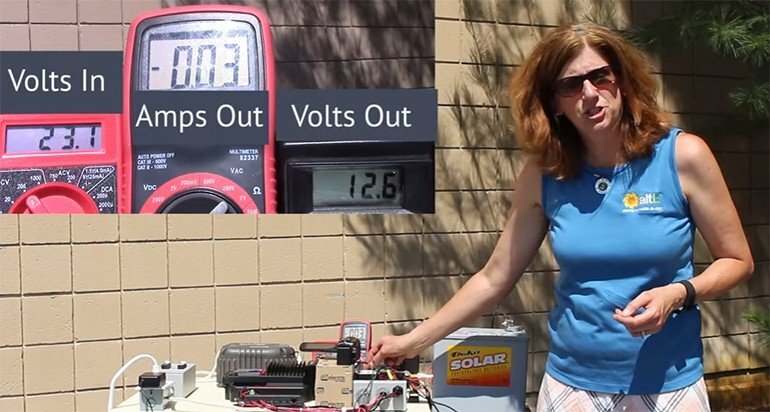 What happens if you have a solar charge controller that is only big enough for the solar panels you’ve got – maybe one panel and a small charge controller or a whole array that’s maxed out – and you want to add more solar panels? Well, all you need to do is wire a second charge controller in parallel in your DC load center, with each output of the charge controller going into the DC breaker box, or load panel. If both charge controllers are turned on, what’s happening is each charge controller is managing independently, sending it’s own current into the battery. So when both are turned on, you are getting the sum of the two because when you wire in parallel, amps increase, and the volts stay the same. There are some charge controllers that will even allow you to connect the two charge controllers together and get even more advanced communication between them. In this particular demonstration, we are not doing that, and they’re still working together, doubling the current by having both charge controllers on and going in parallel to the battery.